It was with great anticipation that we set off for the truffle market that first weekend in February. For me truffles have the sense of the exotic; that special hard to find fungus that is usually discovered by a pig or well-trained dog. They are the ingredients used in Michelin starred restaurants or by TV chefs extolling the virtues of the flavour and smell when shaved upon freshly made pasta. On this Sunday morning we set off wanting to find out what it was all about. Would I buy a truffle? We mused as to how much they would cost? This is a truffle area and maybe they would be good, very good value. How would we store it and cook it? Would it be appropriate to take one to our friend’s house at lunch time in lieu of a box of chocolates? Until this moment, this very special moment, truffles had not really been a part of my life…at all. Well to be truthful I had purchased a bottle of truffle oil at a market a long time ago but had been left slightly disappointed. I once read “Ten Trees and a Truffle Dog” by Jamie Ivey. This whimsical portrayal of life in Provence and the joys of training a truffle dog have long fuelled a latent passion to a) have a dog and b) have truffles growing in an oak wood. Well the former came to pass in the shape of Emmie but a truffle dog she is not! YET! We parked the car and climbed the steps to the top of the town, paper signs dotted around pointed us in the direction of the Truffle Market. I think we had judged the timing right, it started at 10 am and as we were arriving a few cars were pulling up and parking, they too had come to collect the delicacies from the Salles de Fetes. On entering the hall, I could see other sellers. There was a local wine domaine and to the right a seller of meat products, pates and saucisson, no doubt they were flavoured with truffles. But it was the long trestle table that spanned the width of the hall that caught my eye, it was in a place of importance parallel to the stage. A small but accurate weighing scale sat in the centre of the table, behind which three ladies stood, waiting to sell the truffles. We approached the table scanning up and down the flat wooden surface. Then it struck… the realisation that there was not a single truffle on the table. They must be in a secure place behind I decided, no doubt protected from coughs and sneezes. But no, the truth, the painful truth was that the truffles had all gone! In desperation I approached the seller, but it was clear, there were none left. To appease my down cast face, she handed me not one but two book marks upon which were printed truffle recipes. It was blatantly clear that this was the closest I was going to get to a truffle today! You live and learn, we have recently found out that the truffles sell fast, very fast, and one has to be there at the start of the market. I’ll know for next time. Leaving the Salles de Fetes and walking out into the cool air of a February morning I caught sight of the menu board of the local restaurant, every course was a truffle course….maybe this is where the truffles went! A few pictures of the outside of the house at the end of February. The garden is starting to wake up and we are dashing around trying to get jobs done before it bursts into life and things are not so easy to access. We have emptied the old laundry room of the plants that had been sheltering from the winter frosts. The last few weeks have been so lovely that we decided we would risk putting them outside. The olive trees have come out of their winter home and have a new spot at the entrance to the old barn. 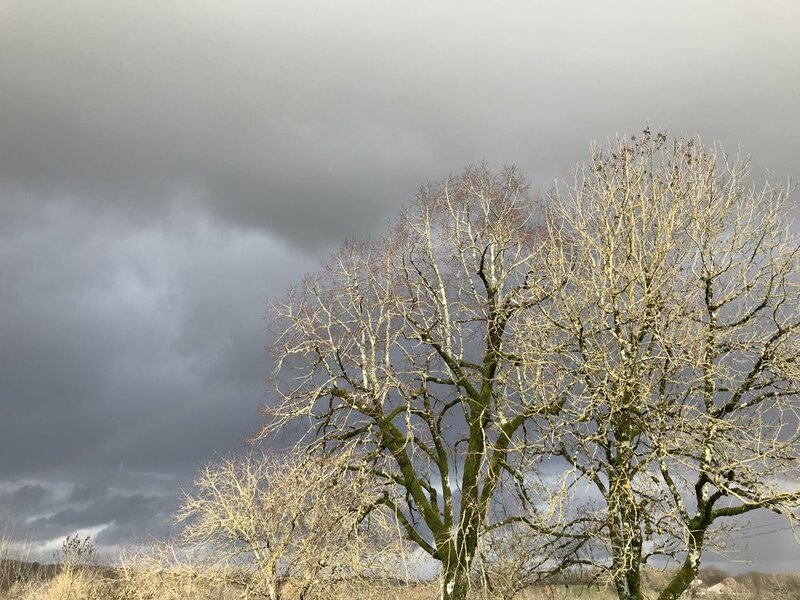 29.02.19 What a difference a day makes…24 little hours! The blossom really coming out compared to the picture yesterday (below). 28.02.19 Blossom starting to appear. The daffodils planted in the autumn were the right way up! They are starting to open now though we do seem to have some without a flower. A bit of feed perhaps and hope for more flowers next year. You are never too old to learn a new skill and since we have been here at The Farmhouse, we have learnt so much …about so much! We have rummaged around and revived old skills and taken steps forward and learnt new ones. Our change in occupation has meant that the things we once did every day, are still useful, but we have added to that knowledge and honed in a different skill set. You can teach an old dog new tricks! For Rob, January has been about wall building and it will probably be the same in February to a certain extent. We are aiming to create a walled courtyard on the “La Vue” side of the house. Where the barrels once stood, we now have a wall. It doesn’t keep Emmie enclosed, far from it, with a quick leap she is on the wall and prancing along it in “show girl” style. For me January has been about marketing, websites, photos and online travel agents (OTA’s ; there is a new acronym I never thought I’d know). I have probably had the warmer job this January and I am not going to complain. We have been continuing with our projects and have now ordered a pergola for the south terrace. At over six metres long the big table will easily sit underneath. This will be directly accessed from the summer kitchen. This terrace is south facing, it can be hot, very hot because in summer it gets the full power of the sun. I think the pergola will be just perfect, enabling those long lunches in a shady spot. I am now looking for the plants that we can grow over it, thus creating that perfect French eating area on the outside terrace. In putting shade in, in the form of the pergola, we have taken some shade away. We have a huge lime tree in the garden which has become more and more open and sprawly. It is a beautiful tree and it takes centre stage in the south garden. The concern has been the combination of the tree in full leaf and a windy day! The other problem has been the shade it casts on the swimming pool ( I know this is a first world problem!). In late summer as the sun begins to drop lower in the sky, the pool can lose its sunlight by early evening. After a hard day working this has often been the time when we get to enjoy the pool and then it’s in shade! On Tuesday Matt, who is an arborist, came to give the lime tree a haircut. It was a big job and a really impressive platform lifter was involved. You can’t help but be in awe of these machines and the engineers that make it all possible. We are grateful too for other people’s skills, whether it be the arborist or the engineer, it all comes together to get the job done. The wall at “La Vue” beginning to take shape. An early morning walk with Emmie. The sun is just coming up and the big lime tree is silhouetted against the morning sky. Lots of cake has been made and consumed this month! Cooking chilli on the wood burning stove from scratch! An experiment that felt such an achievement. A winter theme seems to have been cooking “off piste”. Can’t wait to get the pizza oven. Lovely, we were really pleased with the result. A tree on the edge of the copse, one just waiting for a tree swing? Emmie had her first birthday in December, she is becoming a little calmer…sometimes!! We have praised the weather this month on a number of occasions and been thankful for the sunny T shirt days for working in the garden. Once the sun starts to go down however, it gets cold, very cold indeed. There is always a lot to do in the garden and we have planted more hornbeam and re-potted geraniums in the hope that they will live until next year. The geraniums have joined the olive trees, stashed in the old pig pen and sheltered from the frost. We know frosts can be hard here and the winter nights bitterly cold, so we are preparing. We must have planted two hundred bulbs around the grounds and we wait with baited breath for the spring and for the daffodils and crocuses to emerge, fingers crossed they were planted the right way up! The last few days have been spent on the tiles…so to speak. Our terracotta barrel roof tiles need maintenance. Over time the moss accumulates in the channels, this causes the rain water to build up behind and then it’s trouble!! With buckets in hand we have spent some time sitting on the roof and collecting the moss, some of which has fallen and littered the ground on the perimeter of the wall. It reminds me of the work that the birds do when they scratch and sort out the moss on the roof. We have been on “La Vue” side of the house giving some attention to the old pig pen roof. Sitting on top of the world, up high on the roof, is a great feeling. The scenery, way into the distance with sight of Montflanquin and on a bright sunny afternoon is fabulous. I feel a new plan coming on for a bedroom… in that very spot… with a view, a few years down the line, I think! Talking of birds ( a few sentences back…) we have been visited by a friendly or maybe not so friendly robin this month. Its behaviour is a little strange as it appears to want to come in the house. The little thing sits on the door handle and peers in or flies to the first-floor window and does the same. It seems that maybe it is seeing its own reflection in the glass and exhibiting territorial behaviour of frightening off other robins. The wall on “la vue “ side is taking shape. We have big plans for this area, however they are fluid and waft and wain as we work with the landscape and the raw materials of the land. This will be the courtyard eventually, a place to sit and a place to cook. We have started the cooking bit already, inspired by a visit to a local restaurant where the meat was cooked over an open fire. We decided to use the embers of one of our garden fires to cook pork. It was absolutely delicious, the wood smoke adding a certain flavour and the quality of pork, having been reared only a few kilometres from The Farmhouse, meant it was superb, a real treat that left us wanting more. Emmie has been a big helper in the garden!!! 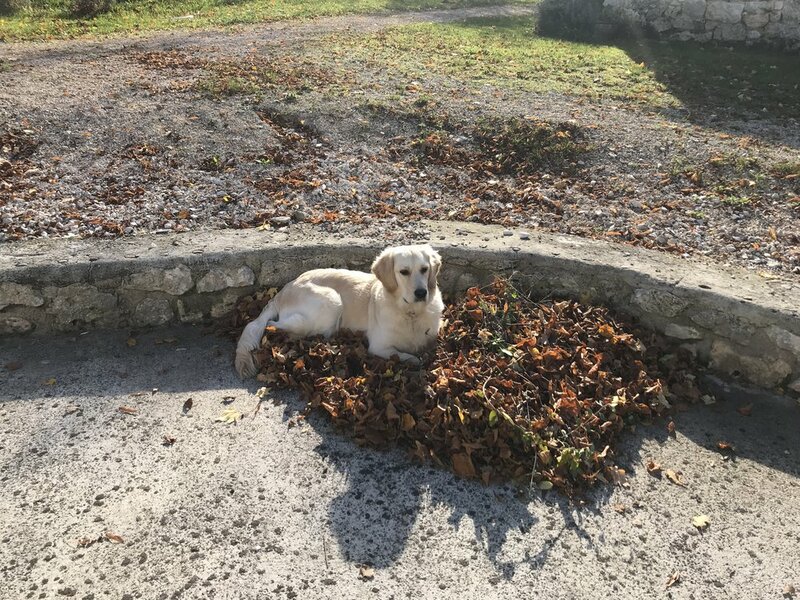 She has loved sitting in the big piles of leaves that we have made, as we attempt to take control of nature! It is a bit of a thankless task as one knows there are lots more to come down, so the job is never finished….. washing up and ironing come to mind! Tournon bedroom. Guests coming to stay…. worth a photo! From The Bolet. Such a beautiful November dawn. The Summer Kitchen. Every now and again you just need to take a photo. Cake and quiche cooked = domestic goddess! The plants hiding in the old pig pens from the coming winter frosts. I can’t believe that the geraniums are still flowering! One of Rob’s cycling routes for the energetic guest. The clocks have gone back and it is now dark by 6:30 pm. We lit our first fire last night in the salon. The log burner, idle and empty for so many months, fires into action…literally! We have had such a beautiful October and even a few days ago felt that the warm weather would never end..but it has! We still have a host of outside jobs to do and the list gets ticked and then added to. October has seen our first appearance on the Alistair Sawday’s website, we were delighted to be invited to join their collection of special places to stay. The first stage of the process was to send information of where pictures of your holiday home could be seen. Initial responses were good so a time was arranged when the Sawday’s inspector could come and see the property. They asses the house and the facilities and also look at its surroundings. We talked about the things to do in the area and our favourite restaurants, that wasn’t difficult ! We didn’t know on the day if we would be accepted as a report had to be written and sent to head office. The following week we received a phone call to say that we were in! People I tell have either never heard of Alistair Sawday’s or it’s the only place they go to for holidays! I remember buying the Alistair Sawday’s books, back in the day before the website world, their recommendations gave a kudos to a place and that’s what we hope it will do for FFQ, it’s someone saying that your place is a good place and it’s a little badge of quality. Click on the link below to have a look at our page on the Sawday’s site, we’d love to hear what you think. There are two quince trees in the old orchard and this year, like many of the trees it has been full of fruit. I have no experience at all of quinces but decided that I should do something with this furry pear. A little searching on the internet got me to “membrillo” a quince paste and quince jelly. These two recipes seemed to go together as the residue of the one provided the ingredients for the other, a win win! Collecting the said fruit turned out to be the first challenge. With pool net , very long secateurs and Robs help we managed to harvest the fruit. (The camera in hand didn’t make the job easier ). Then after what seemed days of chopping, cutting, boiling and using every available piece of kitchen equipment, we emerged with a tray of membrillo, quince jelly and quince puree. Will I make it again? well it has taken 4 years to have a crop of quinces worthy of doing anything with .…so maybe in four years time I will be ready to jar up the jelly again! October and an evening with some of the people who have helped us this summer at FFQ. The anticipation of returning to The Farmhouse begins to mount as the days tick away before our allotted channel crossing. We will have been away for two months and we are eager to see the house again and to slot back into our life in France. Since buying the house in 2014 The Farmhouse has been a labour of love and we have enjoyed the changes and improvements that we have made to the property. So we miss it…… and on the journey home we talk of the next project we will do at the house, and the next and the next! 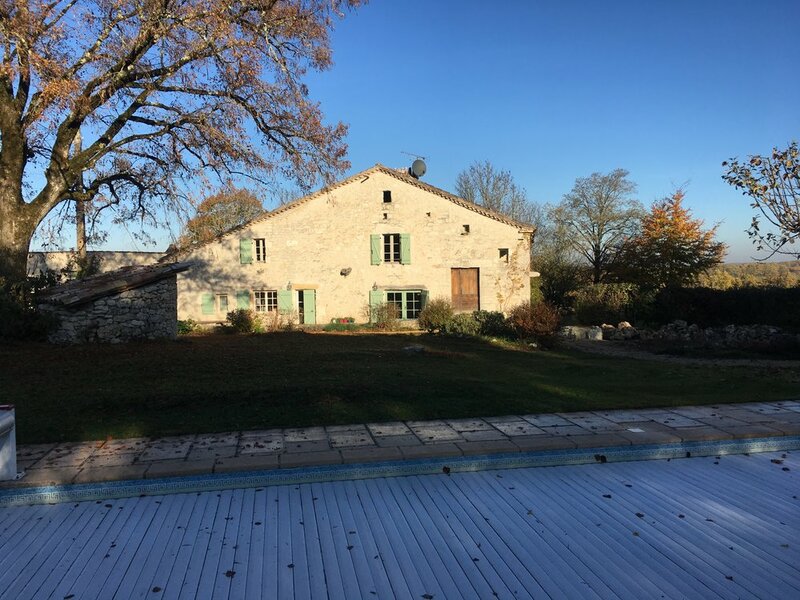 We are happy that there have been lots of wonderful holidays there over the summer, families and friends getting together and we are thankful for the kind messages of appreciation that we have received from our guests and even photos of their happy times at FFQ ( French Farmhouse Quercy). We use the tunnel to cross to France and on the first day decide to stop at Chartres. The car is laden with things collected during the summer, all so important that they can’t possibly be left behind! With the top box securely fastened and Emmie happily on the back seat with her doggie safety belt on, we set off early from our hotel to begin the final leg to Montaigu de Quercy. On this day as we approach the South West the grey clouds and drizzle begin to break and moving further south, cotton clouds in blue sky begin to appear. The sun shines and welcomes us home. We have been back a week now and September has been a continuation of a fabulous summer here in the Lot region, there has been very little rain and we have been told how hot it has been this year. At the house I notice that the farmer has cut the wheat and the straw has gone, the field is ploughed for the next crop. Everywhere is still dry. The fruit trees have been laden this year and I am delighted to discover my favourite Mirabelle tree still bears fruit. I have now picked almost six kilograms of fruit from that tree and made lots of jars of jam! There are some figs on the fig tree on the big field and a smattering of plums on the trees around the pool. For the first time we have quite a few quinces on our tree so I’ll have to decide what to do with those…..any ideas? It’s good to be back, to walk the familiar tracks and catch up with friends. We planning our next swathe of improvements. We have lots of ideas and plans, I let you know what we do in October! Mirabelle confiture, mirabelle crumble …..mirabelle……mirabelle….mirabelle! Montjoi and what a joy it was to visit this town. Montjoi - the view down the valley. 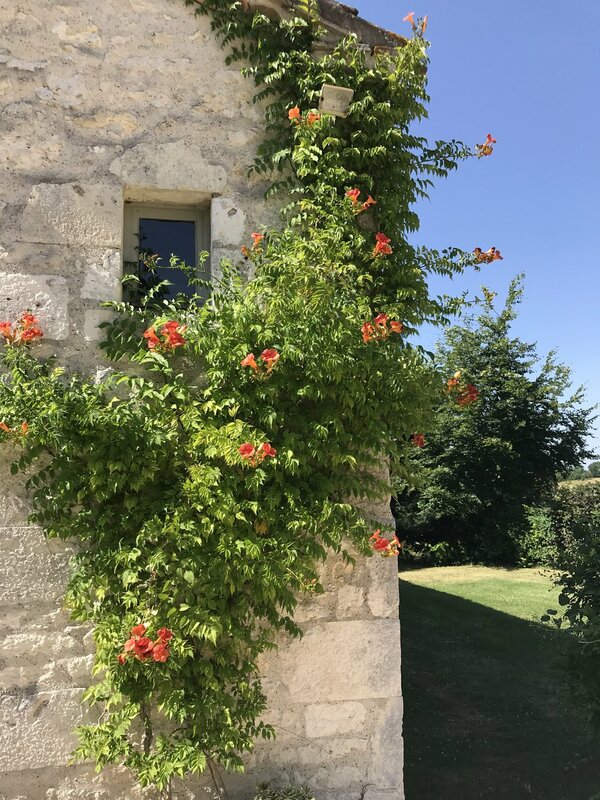 Our summer holiday letting season is now well underway and our guests have the opportunity to savor the summer delights of South West France. During the summer months “ Marche Gourmands” are a popular evening event. Some towns have weekly Marche Gourmands with each town having their regular day. It is a great time to get together with friends and sit in the town square wining and dining. There is usually music from a live band and as the evening sun warms the night air, the dancing and partying begins. The markets in Quercy are full of the fresh local produce, they are colourful and vibrant. The area is known for the quality of food and there is something special about shopping at a market for all that is seasonal and fresh. It's then great to return home and produce a meal to be shared, sitting in the garden, with family and friends. July is all about the sunflowers, it is beautiful to see the fields full of the golden heads turned to the sun. It is no wonder that these flowers are called tournesol in French,” turn to the sun”. During July we have continued to develop and move forward with decoration and new ideas. We have given the pool house a coat of paint and bought new tablecloths to brighten the surfaces. With the BBQ and fridge it is well used in the summer for outdoor dining and provides welcome shade on a hot day. Montaigu and Lauzerte bedrooms have had curtains. We debated for quite a while whether this was necessary as we also have shutters and the stone relief around the windows is rather beautiful and a shame to hide. However the curtains have now been hung and the stone relief is still visible. We are pleased, the large heavy fabric gives warmth and texture to the rooms. Montaigu bedroom and it's new drapes. The pool house, a new tablecloth and clock. The walls have been painted golden retriever yellow! The summer kitchen. This room leads out onto the terrace. This is the second kitchen, the cuisine is on the first floor. The old stone sink in Montaigu shower room. There is a new one too to use! The Campsis or trumpet vine has beautiful orange flowers this year. Last but not least Emmie, she is loving our field now it has been bailed. Emmie - The sun setting on the the sea at Biarritz. This is a beautiful time to come to The Farmhouse, the June flowers are in their glory, the geraniums recently planted are bloomimg and the colours are vivid and bold. With visitors here we have once again been on our travels leaving our guests to enjoy the tranquility and peace of the place. Having spent some time in May on the Mediterranean side of France, we decided to head west to the Atlantic coast. Our plan was to explore the coastal region from San Sebastian in Spain to Biarittz in France. I think I first heard of San Sebastian years ago in relation to the car ferry that goes to Bilbao. Some friends had made this journey from UK to Spain and had spent some time in San Seb, they had of course been delighted with their stay and the memory was formed. I too was delighted with this charming place. It has it all; beaches, wide promenades, harbour, quaint old town and TAPAS! Tapas has never been raised to such high esteem as in the old town in San Seb. Tall tables stand outside on the narrow street and inside the array of tapas lines up in all its glory. While hams hang from the ceiling, the tapas is the star of the show. Standing for a while we shared a plate and a cool drink....had to be done! Moving along the coast to Hendaye, we found a seaside town with Marina. The long promenade with bars and restaurants and a popular beach. St Jean de Luz is a very pretty fishing town. There were artists in the square selling their work and we sat down for a menu de jour, very delicious! The architecture is different in this region, compared with where the Farmhouse is. There is a flavour of the Alps , chalet style. With the Pyrenees not too far away it is not surprising there is a mountain influence in the buildings! Biarittz was my goal, the playground of the rich and famous in the 1920's. From the mid 19th century it was "The queen of resorts and the resort of kings". Apparently it is also the place where surfing began in Europe, there was certainly a surfers culture here with surf schools along this coast. The rocky outcrops and the Bay of Biscay kept us interested as we walked the promenades. The weather was not so good, though better for Emmie in her fur coat! Below the cafe are changing rooms and showers for sea bathing, the above picture shows the stretch of water where people were swimming. Biarittz on a cloudy day. Picture taken in the original fishing village Biarittz. Just loved the colour in this snap! Back at The French Farmhouse the meadow grass on the field had been cut last weekend and turned several times to dry. Placed in formal lines it was then big bailed. 17 this year! Finding some shade on a very hot day, today! So as the sun sets on June we are back to work and preparing for all the guests who will visit us this summer..on..on!! Emmie in the field, five months old. Our first visitors of the season have arrived in May and as you can imagine we were busy preparing for this for weeks... nay months! The tonduse has been whirring around the lawns and making sure they are ready, and we have been tidying and preparing our outside spaces. The big clean always has to be done at the beginning of a new season and then each week the standard can be maintained for each new party of guests. Sometimes I feel like an oil rig worker, work really hard for 3 weeks then get a week off (not sure if that is how it works for oil rig workers or us…. but you get the gist). As my Aunty Norma always says, “it’s all or nothing” and that is just how it is for us! Our clients arrived and after greeting them and ensuring that all was well, Rob and I took the chance to have a week away and explore France. (We did leave our manager Paul in charge should there been any problems). If we are not careful we can always find another job to do at home and we don’t find time to have a holiday ourselves. (I can hear the violins as I write)!! We decided to head for the French, Spanish boarder on the Mediterranean side and we were not disappointed. At this time of year, it was peaceful and calm. We enjoyed the Maresme coast of Spain and its beautiful sunshine before heading back into France and to the charming coastal town of Collioure. I can only liken Collioure to Salcombe in Devon, England. A place to return to for a weekend I think and an easy drive from The French Farmhouse. On travelling through the French /Spanish frontier, we passed garden centres with wonderful, wonderful plant pots. Just the sort that I wanted. The Spanish have long been renowned for their ceramics. This morning before heading home to The Farmhouse we did a slight detour and nipped back into Spain to purchase the said pots. Visitors to The Farmhouse this year will be able to see them on the new drive! Our south drive renovation: the removal of the box, the building of the wall and the planting of the hornbeam has been the project of the winter. It has totally refreshed and opened out this area and we look forward to adding to and developing this area further. May has been our frontier month, the time when we change from moving the house forward with our endless projects , to a time when we stop, smell the daisies and see what we have indeed achieved and more importantly what we are able to provide for our summer guests. This is our busy time of year as we work hard to get the house ready for the summer season after the winter. It is wonderful to see everything waking up, leaves opening, flowers blooming and grass growing. The tracteur tondeuse has been busy whirling around the lawns and trimming and sharpening each blade of grass. The weeds have woken up too, so there’s another job! We have been busy over the winter, building a new wall on the east drive. The box hedge that had to be removed left a huge area of ground to be molded and re-designed. Many, many years ago, the house had been called after the hedge making it even more wretched to have lost it to this caterpillar pest! Thankfully we do have many other box trees and hedges around the farmhouse. They all took a huge hit last year but we are cutting back and hoping to salvage some of the plants, time will tell. In the depths of winter we planted hornbeam hedging, I just hope that there is no little hornbeam eating caterpillar to spoil the plan! We have waited months to see if it has survived and thankfully little leaves of brightest green are filling out the sapling branches. It will develop to be a magnificent hedge too, I am sure. There had been an ancient wall, crumbling and tired that sat between the two rows of box. When the box went it revealed the wall and we set about removing and sorting the stone, preparing to build a new low wall to frame the drive. We now have an area that is much bigger than we had anticipated in fact I think we need a fountain or at least a greek urn to adorn the space, can you imagine it! The builders have been with us for a week. They are replacing a lintel and doing some work on the wall of the poullailler (chicken house). We don’t have any chickens but the perch inside is a giveaway as to what it was used for in the past. I always imagine having chickens one day, though I believe the reality is a little different to my chicken dream! The pool and cover have been cleaned and as I write the water vac is sucking the remains of the winter dust, leaves and debris from the bottom of the pool. The heater will go on tomorrow and with any luck we shall have a pool to be proud of by the weekend. The pool has become a real marker of the years, pool closes, pool opens and 6 months has passed and it doesn't seem five minutes!!!!!!! I have been busy completing our Spring Newsletter and this time we have a focus upon places to eat in the area. I have only recommended either places we have been to or restaurants that we have been recommended to visit. There are some fantastic places to eat here and I can tell you it is a real chore having to go around dining in these wonderful establishments and eating all of this amazing food just for the newsletter!! Oh well it has to be done! Email me at info@TheFrenchFarmhouse.co.uk if you would like to join our mailing list and get a copy of our free FFQ Newsletter. Wishing you all a wonderful May. Had to start with a picture of Emmie and the one iris flower. We also have just the one bluebell in Bluebell Copse. The hornbeam hedge begins to open and the lacy screen begins to grow. One last layer to go on the wall! The new cement mixer in Farrari red. A wall builders essential piece of kit! Emmie at Tessa's Cowslip Corner. The cowslips have been abundant and so beautiful this year, they have lasted a long time too. A beautiful misty morning last week. An early, very early morning walk with Emmie. Le Medieval (Puy L'Eveque), we will be going there again, very soon I hope! Is it obvious I have been doing the "Places to Eat" newsletter? Still a bit food focused! This was my starter at Le Medieval (Puy l'Eveque) it just looks beautiful and it tasted fabulous too. The cowslips all around The Farmhouse are beautiful this year, they have multiplied and the splashes of yellow feel very spring like. The tree surgeon arrived this week to pollard the ash tees and the new view was certainly worth waiting for. We have lost a couple of trees on the north lawn and have decided to replace them with cypress trees. A new nursery has opened near to Lauzerte " La Vida Verda" and we have bought three of the Totem variety from them. These will be planted in the traditional triangular shape meaning welcome! Trying to get the cypress trees in the right place, A mathematical equilateral triangle is what is called for I think! The winter has been harsh and so cold. The rain of January has continued and the back end of February has been freezing. The "Beast from the East" hitting the UK has hit home here too. It has been best to light the fires and hunker down, though not always possible. It seems that south west France can be a climate of extremes with the winter being as cold as the summer can be hot! It has not all been about the weather, we have had other things to occupy our mind. The arrival at FFQ of Emmie our new Golden Retriever pup has bought a new pattern and responsibility to our day. She is mischievous, marvellous and a minx! She stands on the shoulders of giants, being our third retriever, but she is our first female dog. Emmie is a French retriever being one of a litter of 10 and born close by in Villeneuve sur Lot. The breeder, to identify the pups, called her Mademoiselle Verte. We had such a trial choosing her name, getting a family consensus was the challenge. Finally we chose Emmie as the shortened version of Emerald, the green precious stone that links to her first name, Miss Verte! In the kindling basket, her love of sticks is starting early. Not on the sofa already! Helping with the admin in the FFQ office. Getting a lift to the garden. As the snowdrops brighten the garden and the winter pansies push their little faces to the sky, January comes to an end. In France this has been a very wet month, the wettest for a hundred years. Friends invite us to arrive in wellies as their land is too muddy and the charpentier tells us that a natural spring has emerged in his garden. We resolve to check the height of the water in our well. The tree surgeon says while it is a good time to do tree cutting, he can’t climb trees in this weather so the programme of works may be delayed. Was it comforting to know that all the rain has been a result of a very dry autumn? “It is nature re-addressing the balance” proffered the Tree Surgeon. It somehow suddenly seems just and fair that we should have such inclement weather in January. We look forward to the sunshine months and then the rain will have all been worthwhile. The rain has been a boon for our recent planting. The hornbeam hedge is in and we wait with baited breath to discover if it will burst into life in the spring. We have planted some extra too, so if we do have a problem plant we can swiftly swap it around. The driveway where the box hedge once stood is a work in progress as I write. We are widening the driveway and building a wall here, all planned to be completed by the end of April. Our winter outside sitting spot, has been on the “La Petite Maison” side, formerly called the gite. We have thoroughly enjoyed the view to the north, the clarity of the winter air allows us to see right to the valley of the river Lot. When three Ash trees are pollarded in a few weeks’ time, our view will be widened. A win, win for us, a better view and wood to store for our wood burning stoves. Ash is apparently a great firewood, dense but drying easily. Our new log splitter will come into its own once again! The box topiary has gone leaving an open view. The pool covered....for a few months yet! Plenty of indoor time for making pastry. The catkins against the stormy clouds. 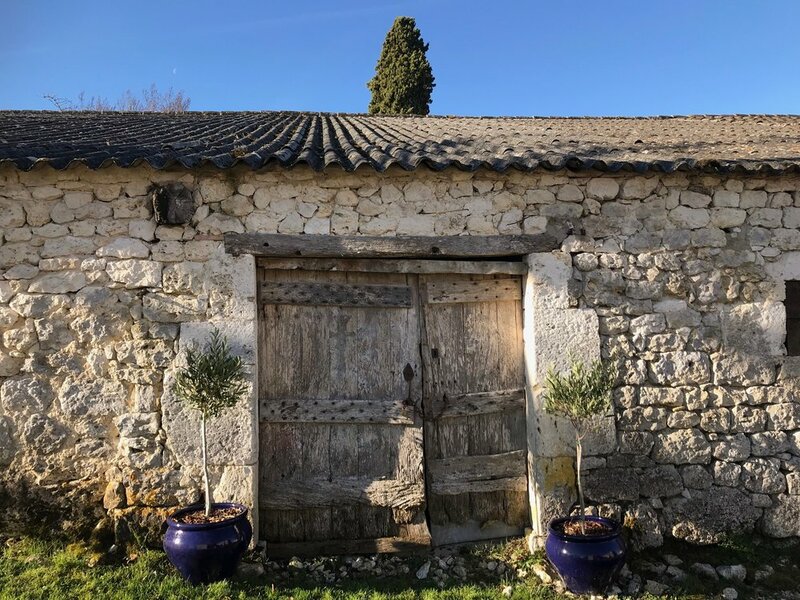 It was a picture of the blue and white cups cupboard that kicked off our instagram account in January, The French Farmhouse in Quercy. In February we finally got the barrels out of the barn and did a bit of jet washing. They are now in use in the grounds, my particular favourite role for them is as herb planters for the parsley, sage, rosemary and thyme. Here is a section of the doomed box hedge, look closely to find one of the caterpillars that caused all the problem! The box hedge which was almost 20 metres long has now been removed, pictures and more information on this sad situation is in the autumn newsletter, contact us if you would like to be on our FFQ Newsletter email list. The hoopoes nested at FFQ last April. Photo Geoff Carss. May and the pool opens for the summer. It's great to see the covers roll back and it feels like the holiday season has started. We gave ourselves some timeout to discover new things in our local area. The above picture was taken in Cahors. We explored vineyards, towns and tried new activities in order to be able to compile our guest information book. July. After postponing our ferry crossing back to the UK twice in order to complete our extensive list of "must do's before the guests arrive", we finally escaped for the summer leaving FFQ in the capable hands of our manager and housekeeper. August: FFQ was full with our guests. This was our first letting season and a major highlight in our year. Thank you to all our fabulous visitors for some truly wonderful reviews. Our last guests of the year departed on the 23rd September, leaving an array of inflatables! I know that some are returning next summer so we will keep them safe 'till then. Drying herbs and the washed walnuts. Notice the topiary box through the window. A man with a digger came and removed the roots, the space is now ready for something new. November: Tete d'Ail. We discovered this rustic restaurant in a side street in Roquecor . Our opinion is that it was well worth finding! The chef has a set price ( around 21 euros) for the three course meal that he has cooked. There is no choice which is fine because then there are no decisions to be made! December and the first snow that we have seen at FFQ. The snow fell on the night that we had arranged to see a Blues concert in Tournon d'Agenais. As we left the house we were concerned that the snow would stop us getting home.... but we made it back. Nights have been cold but the days have been beautifully sunny, we have sat out on the patio for a cup of tea in the afternoon and have been able to work in the garden in t shirts in the afternoon. Our day, with the changing season, moves into a pattern of house chores and admin in the morning while we wait for the mists and light frosts to disappear. As the sun rises higher in the sky the warmer air makes the outside more appealing, the outside projects get all the attention they deserve. Morning mists and frosty fields. We have one very big outside project at the moment, one we had not even contemplated that we would be doing, but we have learnt that there is always a curve ball that takes your energies and resources in a different direction and you just have to be ready to react. The beautiful box hedge that adorned the farmhouse drive suffered so badly last year from the box hedge caterpillar that we have had to have it removed. Sadly it took chain saws and a digger to remove it and all the main roots. We are now tilling the land, removing the million little roots and sifting the soil. Thank goodness for the fair weather of the last week as we prepare the ground for the hornbeam that will be arriving in the next few days. Now is the time to get the new hedge planted so it can get the roots established before the heat of the summer. In taking down the box, which was in fact two lines of hedge, revealed the condition of an old stone wall. This wall was crumbling and unsightly and so began another project that we had not planned to do! In order to rebuild the wall all the stone has had to be remove to the drive and sorted into small, medium, large and rubble. As you can imagine this is no easy task and the aching muscles every morning are testament to how much effort has been spent the day before! It is a bit of a mindless activity throwing the stone to the correct pile and remembering not to linger too long on the decision as to which pile it belongs to! My mind wanders to the archaeologist and all the painstaking digging and filtering that takes place. I am that archaeologist! My treasures are not priceless but are never the less interesting. Why have I found six identical rubber soles from a shoe? I wonder if it is some ancient wall ritual that brings luck and prosperity. I remember years ago when renovating an inglenook fireplace in Wiltshire we found two small shoes and I believe these would have been put there to offer protection to the household. I remember we left them hidden for someone else to find, I think I will do the same with this recent discovery and build them back into the wall! I smiled at the discovery of a sardine tin key, lid duly wrapped around in tight rusty fashion, it took me back to those fiddly lids and the half opened tins from which I had to extricate sardines! Next discovery was the bottom of a wine bottle, not a wholly surprising find, with a very deep dimple of perhaps 10 cm in the bottom. I had always been told that the deeper the dimple the more expensive the wine. So the discoveries continued, small pieces of china and half a plate, metal brackets and a precious key, the list goes on. The key was probably the most exciting discovery, one can only imagine the frustration when that was lost. I think of putting our own time capsule in the new wall so in years to come someone can know something about the work at the Farmhouse. Should we scribe on paper or leave our information on a memory stick? We were amused by a recent item showing how children were not sure what to do with a cassette tape, some putting it to their ear. Will this be the same for the memory stick in the future? No doubt this technology will be replaced and succeeded. While I decide about time capsules and shoes the work goes on and I look forward to posting some pictures of our new driveway in the spring. We finally closed the pool for winter at the beginning of the month, the pool heater can only work so hard and as the days get cooler it is on 24/7 trying to maintain the 28 degrees C. The cover is on for a while now and as always we look forward to the time when it is rolled back ready for the new season. But in the meantime there is lots to do so I am not wishing the months away! The south side. The pool cover on for the winter, the box topiary has now gone. The east side of the house, the lengthening autumn shadows. One of our first jobs this autumn is to deal with the box hedge, it is brown and leafless after the barrage of attack it has received from the box hedge caterpillar this year. It provides us with a real conundrum because now in the middle of October we can see healthy green shoots appearing on the main branches. The risk we have is that by leaving the box hedge in we will only go through the whole process again. The hedge may recover a bit, I doubt to its former glory, and then the over-wintering pupae start the cycle all again. The topiary in it's former glory.... there are three like this. Here is the Topiary now! You can see from the pictures above that the effect of this caterpillar has been devastating to the plant. We have to take some action to ensure the surroundings near the pool are protected. We do have many box plants at the farmhouse, some small and part of a mixed hedge and some much larger. Sadly this blight has made it clear just how much box we do have! I think the best approach is to remove where the environment calls for it and to leave and take a "see how it goes" approach where it is not so prominent. We can hopefully then "hedge" our bets!!! The inflatables somehow sounds like a Disney movie yet to be made and the picture below shows the "guys" that have visited our pool this summer! Blown up to their best one can only imagine the fun that has been had bobbing around...under careful supervision! These plastic floats have been left by their owners, no doubt too heavy to pack into the suitcase for the plane and thus by the end of the season we have a riot of colour and shape... and we just had to take some pictures! Trying to get these together for the photo was not easy, herding cats comes to mind! I had the pool net in hand and pushed them all to the end of the pool..by the time I had dashed to pick up the camera the pump system was guiding them to the other end...anyway here is a less successful second shot as some of them had had chance to escape the picture by then! As you can see in the picture the shadows are getting longer. We have kept the pool open as the weather has been beautiful. It is the middle of October and we have temperatures in the mid twenties, 25 degrees C. The Pool House Project is underway, we are aiming to give it a bit of a refurbishment ready for next season. It is a great space with a BBQ and large dining table, in all essence it is an outdoor kitchen. I'll keep you posted on the developments! 1. What can we do to improve the holiday experience at The FFQ? 2. What did you enjoy most about your holiday? 3. On a score of 1-10 how likely are you to recommend The FFQ to your friends ( 10 being definitely would recommend). I must admit we have thoroughly enjoyed seeing the customers comments and have re-read every word of the praise and congratulation that has been forwarded to us. This farmhouse project has become, though always was, a labour of love and our feedback has been the first sign that we have been doing something right. Our clients are our reviewers and our appraisers and according to them we get to keep our job! Our Autumn newsletter which will be published in October has a selection of testimonials for you to read. If you would like to receive a copy along with other FFQ news, send us your email and we will get a newsletter electronically delivered to your mail box. Email us at:- TheFrenchFarmhouseinQuercy@gmail.com OR use the "contact us" box on this website. Our guests have also given us suggestions as to what we can do to make things even bettter at FFQ and we have started working on those things already. Our letting season is now underway and we hope that all our guests enjoy their time at The Farmhouse as much as we do. During the last few months it has all been about dotting the i’s and crossing the t’s, making everything good in preparation for the summer holidays. The bed linen “situ” has felt a challenge. I could not believe how much bed linen was required…this is not Downton Abbey. I think I was blissfully turning away from the gargantuan task that is counting linen for 6 bedrooms with multiple bed choices and having to account for 3 changes per bed. Without boring you with the maths, it means that I need at least 72 pillow cases…then there are the towels…and …and….and! Thank you “Soak and sleep” for helping me with my purchases and pandering to my panics. We have been delighted with our new outdoor tables. At three metres in length they easily seat twelve. There is one on the south patio and one in the pool house with their matching benches. The time when we can put them together for one big trestle table fiesta is an event I am looking forward to. We have discovered and checked out a new “haunt”. The Chateau de l’Hoste is about 15 mins away. We went to have a look at a local car rally that was stopping there and found ourselves equally beguiled by the chateau. Their Happy Hour ( wine and canapes) is every Thursday between 6-7 pm. We found a friendly chatty atmosphere, held in the relaxed bistro, where it seemed many people were staying on to eat. Separate fine dining was also available in the hotel. Another option for a Thursday night is to visit Lauzerte. Every Thursday evening in high season you will find the Nocturne Gourmet Market from 7pm (the last one this year being on September 7th). We all had a wonderful evening here a couple of weeks ago, on the Place des Cornières, the town square. Trestle tables and food sellers filled the medieval square and live music floated on the air. By 9pm the dancing had begun, not only on the square but on the benches too. The atmosphere was vibrant and exciting. A community party where the focus was on eating, drinking and “bons amis”. Everyone welcome, an evening definitely worth repeating. The region revs up for the summer and provides a raft of activities for all tastes. The tourist information offices in most towns will guide and provide literature to help you make your choices. Look out for placards on roundabouts for events too, though I admit we have on one occasion been let down by our own inability to speed read and translate. Having taken friends to the roundabout advertised event, we found ourselves in a very quiet town waiting for the fun to begin….everyone else was somewhere else! The car rally at the Chateau. Lauzerte, Thursday night high season. The French Farmhouse with new outside table & benches. The table and benches in the pool house at The Farmhouse. This is the season for Vide- Greniers and Brocante. The Vide-Grenier literally mean empty attic and they are akin to a car boot sale. Brocante is a little more on the lines of antiques. These sales take over towns and villages for the allotted day and will be locally advertised. We visited Gavaudun last Sunday for their Brocante. After walking around and eyeing up the things I would like to buy, we went to have coffee at a most charming cafe. Note to self.... don't do this again as some of the things had gone, my new motto is "see it buy it"........ no doubt Rob and I will have a discussion about this policy!! Montcuq market lived up to expectations, after a mosey around, the six of us sat and watched the word go by at our favourite cafe. I managed to buy some local olive oil, so pleased about this as I have been looking for a while. I notice that in this region, in the supermarkets, the olive oil is from Spain or Italy. I finish today with a picture of our "pink flamingo" it is so comfortable for bobbing about and I believe it's really on trend!